Turn your next wine weekend into your Ultimate Sonoma Cannabis Weekend. Sonoma County has everything you need for a fun and educational cannabis weekend. You’ve toured wine tasting rooms and vineyards. Now tour pot farms, extraction facilities and dispensaries in a region that’s become a hub of legal cannabis business activity in Northern California. Enjoy breathtaking natural beauty and agriculture from valley to coast. Stay in private vacation homes that welcome cannabis smokers — and in some cases even provide a gift of free cannabis to all adult guests. Savor world-class food, wine and craft beer. Discover heightened experiences of taste, smell and wonder inspired by cannabis, Wine Country’s other intoxicating crop. There are seven cannabis-friendly lodgings in Sonoma County openly marketing themselves on cannabis tourism websites like BudAndBreakfast.com and TheTravelJoint.com. Three of them gift cannabis to their guests. Two of them are luxe houses in Glen Ellen, smack in the heart of Wine Country. One’s a yurt in Annapolis, in the redwoods near the coast. At any of the three, your hosts will greet you with a legal gift of local cannabis and the private spaces to smoke it. Traveling with someone who does not possess a doctor’s authorization to use medical cannabis or with someone who is not a California resident? If they are adults, gifting cannabis is legal. Can’t book the Glen Ellen gifting houses? Two cannabis-friendly getaways in Sonoma let you bring and smoke your own. Casa Bello, a high-end bed and breakfast in leafy-green downtown Santa Rosa whose guests have included cannabis industry movers and shakers, does not gift cannabis but approves of guests treating themselves to tokes on the inn’s patio. Gotta get the ganja gift? There’s a gifting yurt in Annapolis. Really into cannabis-friendly yurts? There’s one in Occidental, no cannabis gifted. California medical cannabis card-holders will want to explore Sonoma County cannabis. You’ll take a guided tour of Santa Rosa dispensaries tomorrow so before lunch today, pop into Mercy Wellness in Cotati, the nearest dispensary to your pot-friendly Glen Ellen or Sonoma digs before enjoying lunch at X restaurant. Staying in Santa Rosa or that yurt in Occidental? Shop here. Eat here. The popular current may draw you to Russian River Brewing in Santa Rosa. But steer yourself to Petaluma’s Lagunitas Brewing Company for a taproom taste of SuperCritical, a limited-edition collaboration with a leading Sonoma County cannabis extracts company. The beer is infused with non-psychoactive cannabis terpenes — the flavor and aroma compounds of cannabis without the THC. For a taste of what Lagunitas’ hops taste like in cannabis oil, check out AbsoluteXtracts’ new vape cartridges infused with cannabis’ botanical cousin, available at Mercy Wellness and other Sonoma County dispensaries this fall. Book a customized evening of cannabis education and product demonstrations — your own personalized Tupperware-style pot party. Whether you’re interested in therapeutic CBD tinctures or the terpene profiles of local sun-grown cannabis, Herba Buena can get your party curated. California medical cannabis cardholders can purchase products from Herba Buena and have them delivered mail order. Pair the evening with Sonoma County wine or craft beer and light appetizers you prepare in your cannabis friendly kitchens in Glen Ellen or Sonoma. Need local deli/grocery/catering suggestions. You picked up pre-rolls from Mercy Wellness’ top-flight selection. Now enjoy a joint in cannabis connoisseur style — smoked while enjoying a cup of coffee, the classic Hippie Highball. Hop into Emerald Country Tours’ Mercedes Sprinter van for a behind-the-scenes day-trip tour of Sonoma County cannabis dispensaries, cannabis farms and cannabis extraction facilities. Enjoy local cuisine, wine and craft beer for lunch. Romp, or smoke, in the redwoods and along the Russian River. Staying in Glen Ellen or Sonoma? Stimulate your appetite with cannabis then Uber or Lyft 30 minutes and cross the Napa County line to Ad Hoc in Yountville for Thomas Keller’s four-course family-style daily menu. Keller’s famous buttermilk fried chicken, when available, is a $28 dinner add-on. Pro tip: Land at Ad Hoc for the monthly fried chicken night. Staying in Santa Rosa or that yurt in Occidental? Head to Shed in Healdsburg, which Chronicle restaurant critic Michael Bauer says may be Sonoma County’s best restaurant. Boyes Hot Springs. Fairmont Sonoma Mission Inn and Spa. Elegant Mission-style inn atop thermal mineral spring historically revered by the region’s native people for its healing power. An artists’ retreat surrounded by 12 forested acres in the hills dividing Sonoma and Napa counties, near wineries, tasting rooms and gourmet food. There’s a soaking tub in the trees and a sunset view from the full kitchen. Sleeps four: two in Bed House, which boasts a king bed and private bathroom, and two in Barn House, which features a queen bed and short walkway to a private bath with a clawfoot tub and an outdoor shower. Cannabis gifted. $350 per night via BudAndBreakfast.com. Mountain meets water at this secluded getaway in a ranch-style setting that includes a koi pond, swimming pond, hiking trails mountain views and a private hot tub near wineries, tasting rooms and gourmet food. Cannabis gifted. $350 per night via BudAndBreakfast.com. Unique one-room cottage with vaulted ceilings on the grounds where Lu Watters (1912-1989), traditional jazz musician of international fame, built his home. Sleeps up to 6 people. Double bed folds into wall when not in use, couch converts into double bed, and the loft with a padded, carpeted floor accomodates two in sleeping bags, with hexagonal window overlooking the private patio area. Flat-screen TV with surround sound, local phone and wireless internet service, washer and dryer, natural linens provided.Near Highway 101, 3 miles from Sonoma Stage University. This is the home of traditional jazz musician Lu Watters (1912-1989). The 1,300-square-foot brick home is furnished with old-world Tuscan elegance, and has Italian tile and artwork throughout. Enjoy Lu Watters recordings from the days of his nightclub, Hambone Kelly’s, on the Bose sound system. Easy access to highway 101 and the Sonoma/Napa wine country hot spots in the Alexander, Dry Creek and Napa Valleys, coastal beaches, Valley of the Moon, and the spa towns of Calistoga and Sonoma. Sonoma State University is close by. A cannabis-friendly bed and breakfast in tree-lined downtown neighborhood. The 1870’s-era Victorian home is made from ancient redwoods harvested from the northern part of Sonoma County. No cannabis provided. Smoking is allowed on the inn’s outdoor patio. Just because the phrase “wine and weed” rolls off the tongue doesn’t mean wine and weed should cross your lips together. 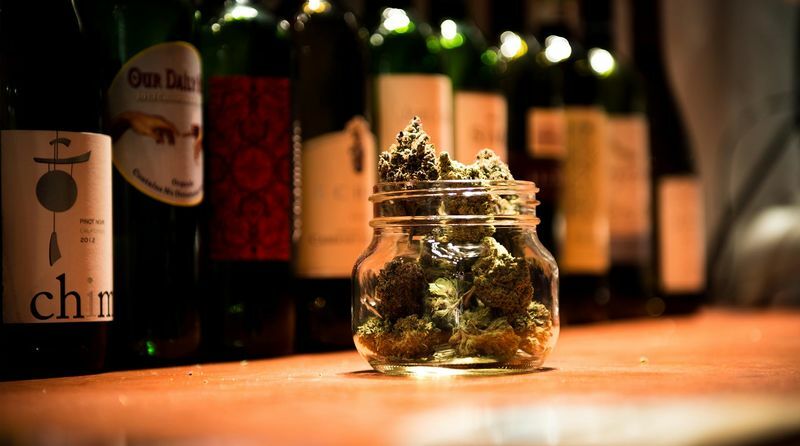 Some thoughts on mixing cannabis and alcohol — even beer and wine. Cross-fading effects. Also: pairing tips if you’ve just gotta have a glass of wine, or beer, and a joint or bowl. What’s legal and where it’s legal. Gifting is legal under Prop. 64. One adult can give another adult up to 1 ounce of cannabis in California as long as money does not change hands for the product. You can consume recreational cannabis in private residences, private buildings and on private property with owners’ permission. If you’re a medical cannabis user, you can smoke medical cannabis anywhere cigarette smoking is allowed.